The trouble started when an attorney for Diego Valley Charter, a school serving predominantly Latino and Chaldean students, sent the district a letter threatening a lawsuit unless the district changed from at-large elections to district elections in which a minority community can constitute a majority in an individual district, having a stronger chance of electing a board member who will reflect their concerns. The move came after the district sued to try and shut down Diego Valley and certain other charters, as ECM previously reported. The District hired an outside consulting firm to draw up proposed maps. (View map 1, map 2, map 3). Priscilla has long been a dissident board member and its only strong advocate for building a high school in Alpine that was twice approved by voters in Props U and H. The district has refused to build the school, sparking a Grand Jury investigation. It ignored the Grand Jury recommendations and refused to turn over remaining bond funds to allow the neighbor Alpine Union School District to build the high school. The County Board of Education recommended that the state approve Alpine parents’ request to split off from the GUHSD and let the AUSD build the school. The AUSD and Alpine taxpayers sued the district. The lawsuit and unification decisions both remain pending, with taxpayers on the hook for over $2.9 million in legal fees approved by the board thus far. All three of the GUHSD’s proposed redistricting maps would leave Alpine represented not by Schreiber (who lives in Lakeside) but by Jim Kelly, a vocal opponent of the Alpine High School who has treated Alpine residents with disdain, many residents complain. Kelly’s new district snakes across a vast area, from Lakeside in the north, east to Alpine and south to encompass Jamul near the Mexican border, also raising questions over the lack of neighborhood cohesiveness. Moreover, since board members may remain in office after redistricting until the next election, there is a second concern. Schreiber would be in the same newly created district as board member Robert Shield, who lives a half mile away from her. Schreiber’s term is up two years before Shield’s—so she would be forced off the board, with no district in which to seek reelection for at least two more years. 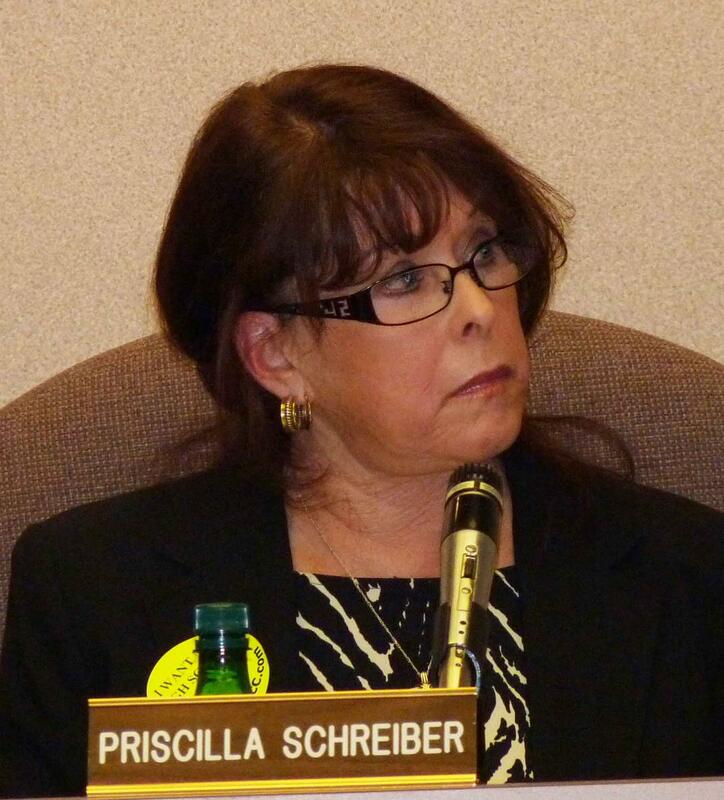 That leaves voters who support Schreiber effectively without their elected representative, or trustee, on the board. Thus far, two prior hearings on redistrict drew only two public comments. Schreiber hopes once the public realizes what’s at stake, more people will turn out Thursday at 4 p.m. to speak out in what is likely the last opportunity for public testimony. Schreiber also questions why the board is holding such an important meeting at 4 p.m. when many residents are at work, instead of at the board’s customary meeting time of 6 p.m.
Nick Marinovich recently resigned in protest from the GUHSD’s Citizens Bond Oversight Committee. He has also accused the board of wrongdoing. Asked about the redistricting plans, he called the board’s action a move to “legislate out a Board Member who actually stands up for what’s right and asks real questions. The move lacked transparency. No map shows the location of trustee residences in relation to proposed boundaries. Meager discussions about the impact of the Chaldean community representation on the Board. There is a clear move to solidify the Tammany Hall-like style of this Board majority,” he said, adding that he has been threatened for speaking out against the board. He also objects to the Board’s recent move to restrict public testimony to only 3 minutes per person for an entire meeting, not 3 minutes per agenda item as it was in the past. Attorney John Lemmo, who sent the letter to the district warning of California Voting Rights allegations, also objects to the redistricting maps. (The CVRA calls for protection of language minorities, in addition to other designated minority groups.) His letter specifically noted that nearly half the GUHSD population is Latino, but no Latino board member has ever been elected. Verbally he has voiced concerns over the Chaldean population as well. ECM has contacted National Demographics Corp., the consultants hired by the district to draw up the maps, to ask them to respond to the criticisms. The company has not provided answers. Destroying public records the day they are received raises serious questions of legality and transparency. It also begs the question: why fund a report on potential voting rights allegations and then supposedly refuse to read it, or make the document available to board members and the public? Back in 2010, after the Census results were released, the County Office of Education concluded at that time that there was not a need for the GUHSD to move to trustee-area elections, but the board instructed the Superintendent to bring any change of circustances back to the board for possible reconsideration. Since then the area has had a massive influx of Chaldean and other Arabic-speaking war refugees from Iraq. So why wouldn’t the superintendent share results of the 2011 report with others? Some concerned residents, who spoke under condition of anonymity fearing retaliation from the board, also criticized secrecy of the recent redistricting proceedings, noting that discussion of possible litigation have led to discussions out of the public view during multiple closed session meeting. Some also questioned why more was not done to notify the public, such as posting notices on all high school websites, on social media for the district and the high schools, sending press releases to media (not just agendas), and more. A check of several high school websites several days before Thursday’s hearing found nothing posted, though the district does have info on the redistricting on its homepage. A notice of Thursday’s hearing is buried on an inside page, published in English, Arabic and Spanish. ECM reached out to the State Office of Education to inquire if it has oversight on this issue, but Charlene Cheng responded that these are “local issues” and declined comment. ECM also asked the GUHSD to respond to the concerns raised by many voters and district residents. Catherine Martin said notices of the public hearing Thursday were published in the East County Californian and posted at all GUHSD campuses and in local libraries (but apparently not in online media or social media sites, nor campus websites). She said notices were also distributed to constituency groups including principals and directors (in person and electronically), PTSAs (Parent, Teacher and Student associations), department chairs and site leaderships councils, the distict’s English Language Advisory Council, and GUHSD feeder district superintendents who were asked to distribute to schools. Notice was also published in the GUHSD Superintendent’s Newsline in January and February, as well as in the Superintendent’s Board Report and on the District’s website. Martin also says the CVRA applies “only to at-large voting, not to trustee areas, so has nothing to say about the shape of the trustee area,” a statement Schreiber disputes. Martin notes that district’s must be equal in population, and the eastern portion is less populated, thus larger. “district elections in which a minority community can constitute a minority in an individual district” Don’t you mean “district elections in which a minority community can constitute a majority in an individual district”? California has independent redistricting commissions to draw impartial districts for congressional districts, but I guess this doesn’t apply to High School Districts, does it? It should. This sounds like a case in which the majority on the Board controls the redistricting process in order to give themselves control over the Board. At large elections in one large district may give superior results over majority rule, winner take all elections in multiple districts. Gerrymandered districts insure that the final result will be no minority representation. John – Yes, that typo has been fixed on our site; can the editors here please correct it?